Embark on a unique adventure from the creative minds behind LittleBigPlanet™ with your new friend, the adventurous IOTA or the intrepid ATOI — a papercraft messenger from another dimension with a unique message to deliver — to you! A paper world brought to life. Objects will tear, fold, or crumple, and can be manipulated by your virtual fingers — just like paper in the real world! Immersive PS Vita system Controls. 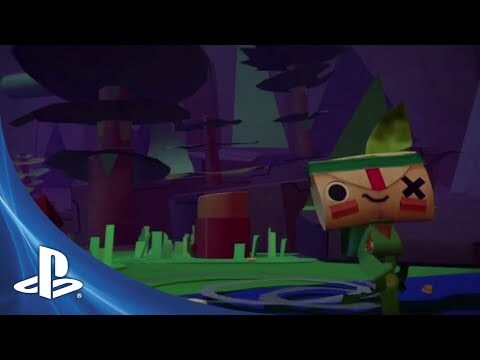 Tearaway uses the full range of PS Vita system’s features to deliver the most immersive and unique experience that only the PS Vita system can deliver. A different adventure for Every Player. From unlocking the unique message inside your companion’s head, to decorating and customizing how they appear inside the game, Tearaway delivers a personalized gameplay experience. Bring Tearaway into your world. Tearaway rewards players with real papercraft elements to print out and construct to bring the world of Tearaway into the real world. ©2013 Sony Computer Entertainment America. Developed by Media Molecule. Tearaway is a trademark of Sony Computer Entertainment America. “PlayStation” and the “PS” family logo are registered trademarks and the “PSVITA” logo is a trademark of Sony Computer Entertainment Inc.